The Bandwagon Campus Tour is back! For the first Campus Tour of 2019, Bandwagon is teaming up with SMU SoundFoundry for Starry Nite XXIX, for a night of music magic. Much like last year's SMU SoundFoundry x Bandwagon Campus Tour, seven bands will perform at the Campus Green this April. Famed Singaporean bands brb., and Subsonic Eye top the stacked bill, which will mark their debuts with the Bandwagon Campus Tour. No stranger to live performances, Subsonic Eye, whose 2018 album Dive Into saw favorable reviews, has been putting on show-stopping performances for years. brb., on the other hand, formed in 2018, will be showcasing its brand new amalgamation of funk, r&b and soul for SMU students for the first time ever. The bands will be joined by multi-genre eight-piece outfit SIVXN which blends the worlds of pop and r&b together, contemporary blues-leaning outfit Breedlove, '80s throwback funk sextet scrbs., '90s funk rockers The 1990s, and female-fronted pop, rnb and jazz outfit Jo & The Boiz. 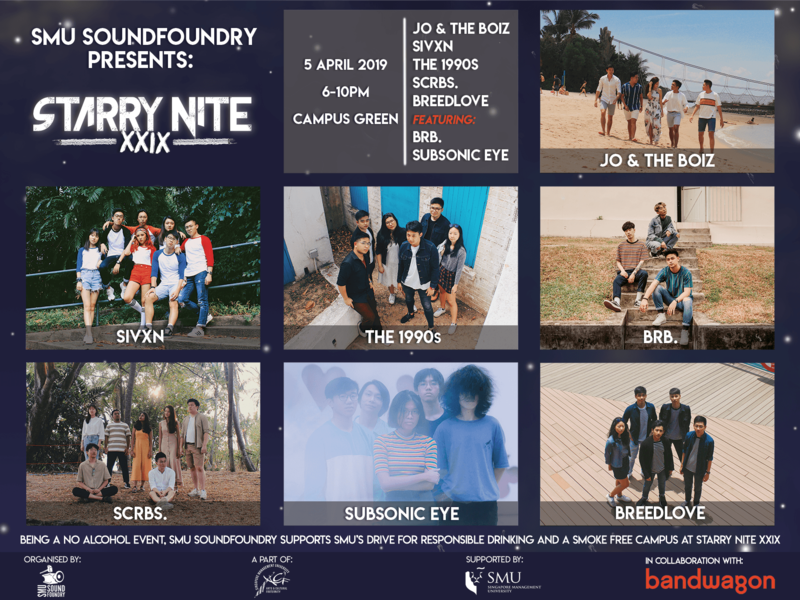 In conjunction with SMU SoundFoundry, Starry Nite x Bandwagon Campus Tour will take place on Friday, 5 April from 6pm till 10pm at SMU Campus Green. Entry is free and open to all. For more information, visit the official Facebook page. Starry Nite is SMU's largest campus-wide concert that serves as a platform for talented SMU musicians to perform on the big stage and celebrate the end-of-semester with the community. Bandwagon Campus Tours have been held since 2017 and are organised throughout the year to spotlight top tertiary bands and introduce more great original Singaporean music to everyone.